So you work out, eat right, lift weights, follow every fitness trend (or not)–but you may still have that little (or big) bulge on your stomach. My mother calls it the “ponch.” On men, it’s the gut or keg or…you get the picture. Before scouring the internet for the latest exercises or strange devices that promise results, check in–can you touch your toes with straight legs? If not, your hamstrings, the muscles on the back of your thighs, may be to blame. In Pilates, every exercise we do is in some way related to the idea of “neutral pelvis.” This is the position when your hip bones are facing directly ahead, they are not tilted one way or the other. If you were to lie on your back, those hip bones would be facing directly to the ceiling with bent knees. Working from neutral pelvis is the key to getting the muscles in the lower part of your trunk to fire. It’s often not just your rectus abdominus, but also the iliopsoas and pelvic floor muscles. If you can get them strong, they will support your lower back and much of your back pain can be eliminated. You can also feel confident wearing low rise jeans. But–if you have tight hamstrings, you can’t physically be in neutral pelvis while standing. That means all day long, when you sit, stand, run–you are not toning that tummy. You can go to the gym for hours a day or bike, hike, whatever, but if your hamstrings are very tight–you won’t get the results you desire. 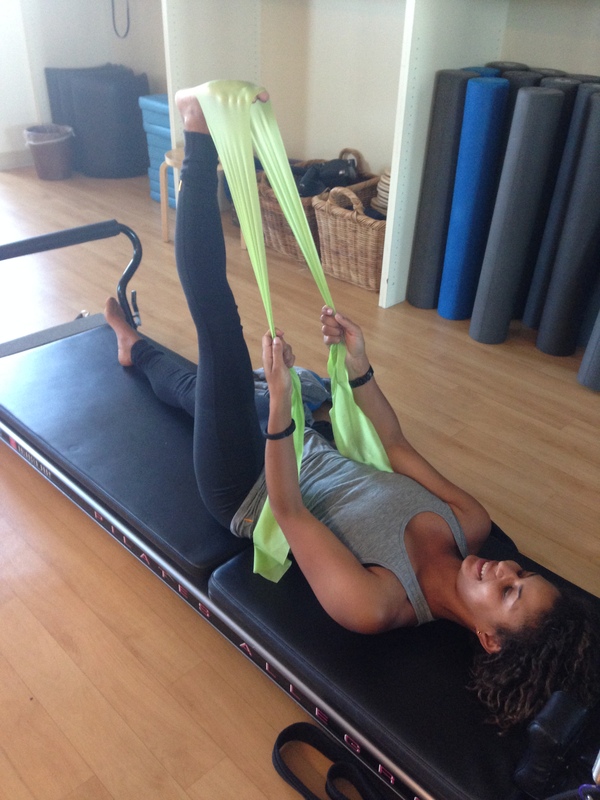 There is a lot to this idea of Pilates and I recommend getting started with an instructor knowledgable about “west coast” Pilates style for a broader perspective on neutral pelvis. But in the meantime, start stretching your hamstrings! You want to be able to have a totally straight leg. Once your leg is at a 90 degree angle and totally straight, there will no longer be a shift in your pelvis away from neutral. Grab a belt, towel, loop from your bathrobe–any tool to help you accomplish this. You do not need a fancy theraband or yoga strap. And–if you favor group exercise classes, don’t leave early and skip the stretches. You are doing your body a disservice. Your tummy will thank you as it becomes more toned. One of the reasons that post natal women often struggle with the ponch is that their pelvis has totally shifted during the pregnancy so it takes awhile to get it back to neutral. Post natal students should most definitely stretch their hamstrings to hasten the progress.